Peter McGrath has told his Fermanagh side not to be overawed in Sunday's big Croke Park occasion when they face the Dubs in the All-Ireland quarter-final. McGrath acknowledges that he will speak to his players about what playing in front of passionate Dublin supporters is going to involve. "We will be performing in front of 60,000 raucous fans and the noise is going to be there," said McGrath. The Erne boss is hopeful that skipper Eoin Donnelly will be fit for the tie. Donnelly sustained a hamstring injury during Saturday's All-Ireland Qualifier Round 4A win over Westmeath. "A scan has revealed no serious damage. If there is a tear it is miniscule," said McGrath, who added that he feels it is an "occasion his players should relish". While McGrath accepts that the Sunday will be a big day for everybody connected with Fermanagh GAA, he insists his team will prepare for the game in "exactly the same fashion" as for all their previous matches this summer. But the Down native knows his team will be facing a Dublin team that will represent a significant step up in class from the sides they have faced to date in the championship. Last week, most Fermanagh fans were keenly anticipating a possible last-eight encounter with Kerry but Kildare's surprise victory over Cork means the Lilywhites will face the Kingdom earlier on Sunday afternoon at headquarters. "But whether it was Dublin or Kerry, you were always going to be up against it and you were going to have to produce your very best to have a chance of competing against either," added the Erne County boss. "The big difference in playing Dublin is going to be the crowd size and the atmosphere. "If we had been playing Kerry in the first game at two o'clock, Croke Park probably would have been about a third full at the start and in comparison to the second game, the atmosphere would have been relatively quiet. "And while you can argue whether Dublin are the best side in the country at the minute or not, there's no doubt that they are definitely the most glamorous side in the country. 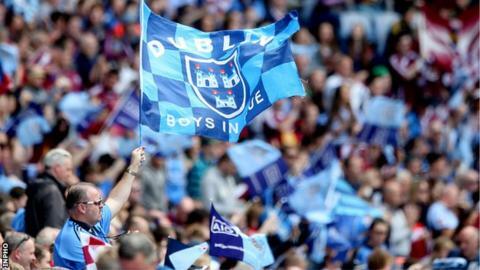 "Every pundit and indeed virtually every person in the country will be saying that Dublin are raging, raging hot favourites and that we don't have a chance of living with them. "But we firmly believe that we can compete with them if we can produce the kind of football we are capable of. "We have some very, very good footballers and our attitude and mentality is strong and we will go to Croke Park with a lot of belief after the way we have performed in our recent games." McGrath watched the DVD of Dublin's Leinster Final triumph on several occasions in advance of his team's win over Westmeath on Saturday although the Erne boss acknowledges that he was focusing primarily on the Lakelanders. "I will obviously watch Dublin's games more closely now in the build-up to Sunday although I have been following their progress so far this summer." From his perusals of Dublin's performances so far, McGrath agrees with the assessment that Jim Gavin's side have rowed back somewhat from the all-out attacking philosophy which came undone in dramatic fashion against Donegal in last year's All-Ireland semi-final. "I've no doubt that Jim Gavin looked at what happened against Donegal last year and probably came to the conclusion that Dublin just can't adopt an all-out offensive approach in every game expecting to blow teams away," continued the Fermanagh boss. "The way players are performing their roles has probably changed in a few positions but they are still capable of racking up big scores." As for Fermanagh, don't expect any dramatic change of tactics this weekend. "We have certain pillars in place in our team and we are not going to change that in six or seven days. That would be crazy." As a final aside, McGrath jokes about statistics and history being on Fermanagh's side heading into Sunday's game. "Somebody said on Twitter the other night that Dublin have never beaten Fermanagh in the championship and that I as a manager have a 100% record against Dublin in the championship. "Granted...that was one game. The 1994 All-Ireland Final when Down beat Dublin." Needless to say, Fermanagh have never met Dublin in a football championship game.